About 20 years ago I really thought that people would never wake up about the welfare state taking us down the drain together but it seems to me that people are waking up and realize that Obama’s plan is a dead end. These cartons are great. They make the point better than 5 hours of arguing can do. Keep up the good work. They may all be counter-productive to some extent. They give voters ideas on how things really work 🙂 and entice them to commit economic suicide. …and in most other countries, the ones with longer histories (especially Europe), voters have figured out how voting really works and very few have chosen long term prosperity over short term redistribution. Sooner or later Americans will fall in the same trap — Oh wait a second, I think they finally have. In retrospect, 2008 was probably the event horizon. I see the cartoons and think “Hey, I want to ride too…”. It’s summertime, the grasshoppers are having fun, come join us, let the exceptional figure it out. Yes you can…no they won’t. 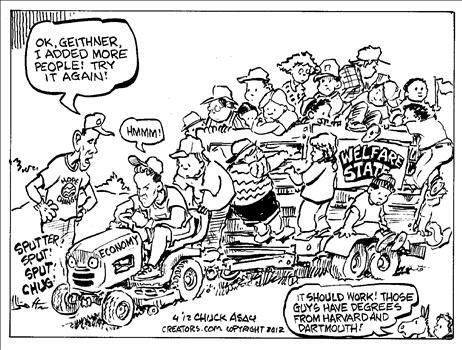 There is an error though in the “How the welfare state starts/ends” cartoon. The “ends” cartoon portrays life on the cart as lavish. In reality, life on the cart gets harder and harder, poorer and poorer as time goes by, but no one wants to be amongst the first fools who jump off to pull. Some pathologically ambitious people keep pulling, once in a while some young chap gets off the cart in frustration and starts pulling, only to exclaim &%#* it shortly after and get back on the cart. Meanwhile the Genghis Chan cart, hauling three billion people, late to start and still well behind the western voter lemming cart, is now approaching fast like a steamroller. The western voter cart lemmings will soon be dispatched to condemn future generations of once privileged westerners into worldwide averagedom. This is how it ends folks. Watch Europe go off the cliff. The slope of American electoral dynamics is now steeper than the friction coefficient. You will fall off the same cliff. “I” before “e” especially after “h”? 03.05.2012: Thi same family who invented thi motor bike invented thi motor per say: a Scottish Aboriginal Australian, named Davidson at birth: with American Indian twin relations. Interesting in your cartoon “thi people” are driven by a motor engine, in thi past we were pulled in a cart with tyres. Davidson says he invented thi first train too: tying two carriages together because they couldn’t all fit into one. I’d have to vote for your previous first choice. It adds in the overwhelming sense of menace that the overbearing government is giving the economy.